Banking 1.0 was the phase when private banks were allowed to open shops across India. Banking 2.0 was the phase when ATMs were introduced and now, Kotak Mahindra has launched the next version of Banking, which we have aptly named as Banking 3.0: Jifi Account. It’s a zero interest saving account which can be opened by depositing Rs 5,000, and the unique part is that, this account would be integrated with Facebook, Twitter and other social media platforms! 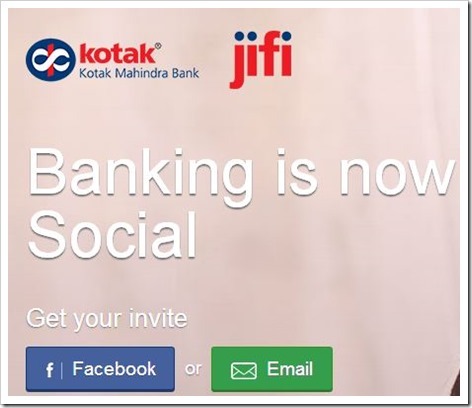 With Jifi, Kotak Mahindra has introduced a new paradigm in digital banking. Jifi Bank account can be opened by any individual by asking for an invite via email or Facebook; in case you don’t have any Facebook account then you won’t be able to enjoy the loyalty programs offered by this banking account. Targeted for the youth and IT-savvy Indians, Jifi account will definitely help and encourage online banking and online shopping more rigorously. KVS Manian, President, Consumer Banking at the bank said, “About 98 per cent of our transactions take place outside the branch, with about 50 per cent in ATMs. The rest are on the Internet and mobile,”. Jifi account holders can get account updates by sending a Tweet at @KotakJifi; whereas a dedicated account: @kotaksync will send the messages directly to the account holder’s Twitter account thereby maintaining secrecy and confidentiality of the transactions. The best part is the extremely flexible and feasible loyalty program. Customers can earn transactional loyalty points by performing specific transactions such as using debit cards at ecommerce portals etc. At the same time, a customer may earn social loyalty points by inviting friends and family members; commenting and liking on social media platforms etc. All these loyalty points can be redeemed after a specific period of time. In addition to these, a Jifi customer gets one year subscription of “Kotak MoneyWatch” a tool used to monitor personal investments and insurance plans. Balance over Rs 25000 would be automatically converted into a fixed deposit, thereby earning interest for the account holder. All other facilities such as debit cards, net-banking facilities, toll free numbers etc are already present in the account holder’s option. The customer can even shop using Kotak Mahindra’s mobile apps, especially designed for Jifi account! Besides the metros, this account facility has been opened in 11 cities including Jaipur, Coimbatore and Pune. FlairStrip’s 48Mbps Unlimited Broadband @ Rs. 479 p.m; Worry Not, It is an April Fool’s Joke! I want to open my account in kotak JIFI in pune branch…plz tel me procedure for this……. Kindly reply for my mail.. Interesting concept. Any idea how successful the b2 concept of ICICI was? This looks similar but with a social twist.